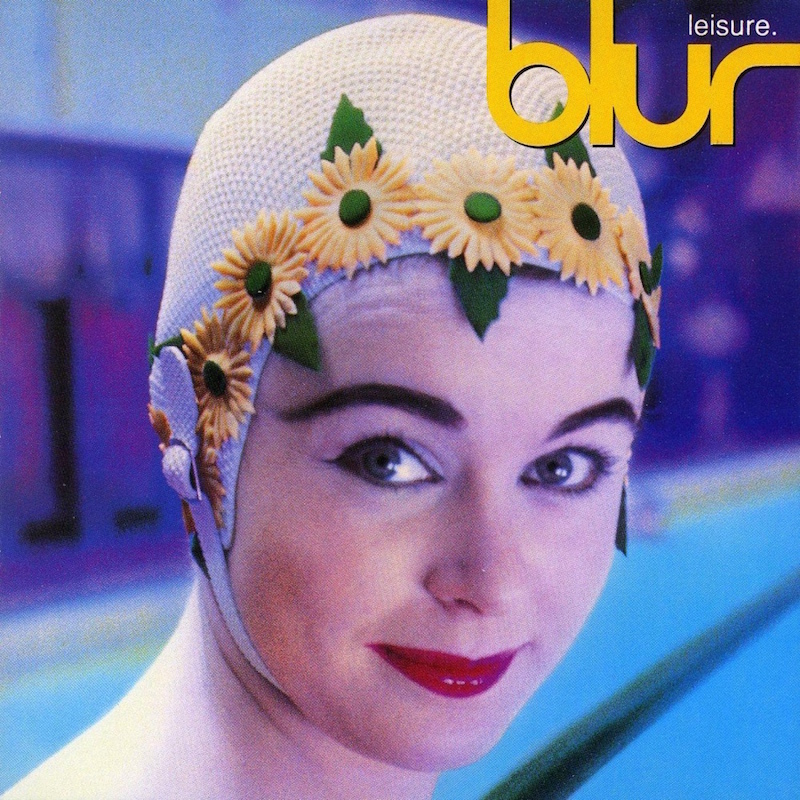 Today’s POP RESCUE is the 1991 debut album Leisure by four-piece British indiepop band Blur. The 12 track album opens with debut and lead single, She’s So High, with it’s growling guitar introduction, and building drums. It initially reminds me a little of Are ‘Friends’ Electric? by Gary Numan and The Tubeway Army. Damon Albarn‘s vocals waft in effortlessly and we’re soon into the chorus. The bassline from Alex James, is lovely, and overall, this song just flows, and reminds me of a summer time gone. Somehow, this song only got to #48 in the UK singles chart. An underground train arrives, bringing in next song, and second single, Bang. This is followed by catchy guitars and Damon’s familiar vocal style, taking the single to #24 in the UK. Slow Down is up next, thrashing in with snarling guitars and drums. Sadly, I find this one a bit difficult to get in to. Repetition follows and this is much more mellow and downbeat. The beats are sluggish here, along with the wonderfully slow howling guitar repeated riffs. Musically, the song builds perfectly, before returning back to the repeated guitar looped riff. I really like this song. Hard beats and what sounds like an accordion begin the up-tempo Bad Day (although, I’d argue that as a good way to start the day). This is a really catchy song, and at times, vocally and melody-wise, it reminds me a little of some early Beatles tracks. Piano and guitars begin Sing – a song that Coldplay cited as being an influence for their track Lost, and i can instantly hear this, along with some occasional Saint Etienne. The song wafts along for just over 6 minutes, with occasional vocals from Damon. It’s a really nice sound, even if it’s not ever-so ‘song-like’. Second single, There’s No Other Way, is up next – a complete contrast. This song has a fast pace and is hugely catchy. It’s near impossible to not want to dance and sing along to this song. The bass, beats, and guitar riffs are wonderful, and a classic 90s song that got to #8 in the UK singles chart. Absolutely flawless. This is followed by Fool, which returns to heavier guitars. There’s a couple of guitar vs drum fill sections in this song that make it feel a little disjointed, but the main melody soon returns with Damon’s vocals. Ninth track Come Together is a delightful romp, with a great pace, and Damon makes light work of the verses, and there’s some really nice vocal harmonies here too. Up next is the mid-tempo High Cool, which opens with a fade-in guitar, and soon bounces into the verse. The verse is pretty minimal, but the chorus again has some nice vocal harmonies with the rest of the group. Bass and rhythm guitar have some nice looped segments that help carry the song along. I love the drum-fill. Penultimate track Birthday, is a slow track that gradually builds up. The lyrics feel like they might have been written by a 4 year old. Thankfully, at about 2m 43s the roaring guitars and heavier drums carry it out. The album closes with Wear Me Down, which seems a little ironic, considering that it’s a hard and fast track that really belts it out. Damon’s soft vocals really fit here in a great contrast, and there’s a few moments where there’s some Brendan Benson-esque vocal harmonies amongst the soaring guitars. Overall, this album has some great songs on it, but it also has it’s fair share of droning, tuneless, tracks that feel a little lost. Thankfully both Blur and Parlophone/EMI didn’t give up at this point, allowing them to go to create some great songs and albums, and give Oasis a run for their money. Even Damon has slated this album, calling it ‘awful‘… but that seems somewhat harsh. Blur have continued to release albums, but their biggest success came in 1994 with their Parklife album, and first number one single Girls & Boys. Their seventh album, Think Tank was released in 2003, and so far, serves as their final album. The group resumed performances in 2008, but further albums have so far not been released. In 2010, a band documentary film No Distance Left To Run was released. Damon Albarn, Graham Coxon, Alex James and Dave Rowntree have all worked on various other projects and with other types of creative media. Dave became a solicitor during the group’s hiatus. Damon went on to front the highly successful Gorillaz act, Graham forged a solo career, and Alex often turns up as musician on various other recordings, including Darius, and Betty Boo‘s Wigwam project. 1991 UK CHART POSITION: #7, certified Gold. Posted in 1990s, BlurTagged 1991, album, Alex James, Damon Albarn, Dave Rowntree, Graham Coxon, Leisure, review, She's So High, There's No Other WayBookmark the permalink.